Friday morning three well-dressed men stood in the rain and decided who would wear one of the two hardhats they had. Around them, local television crews readied their equipment. The three are part of the investment group around Stazione: 25, a new 301-unit apartment complex which will sit perched on the slope of Beacon Hill overlooking Rainier Valley. In front of the rolling cameras, several amused construction workers, and an RV parked on a dead end street on the hill above the clearing, they proudly announced their team had completed financing the project with the approval of a $76 million 221(d)(4) loan from the Department of Housing and Urban Development. The owners explained the Italian “Stazione” refers to the area’s diversity in hosting a community of Italian immigrants. Behind them, overgrown, rain-soaked lot sported a slatted chain link fence filled with graffiti and several piles of garbage. The only remaining building on the property stands abandoned. [Photo: Will Sweger] The pattern here mirrors that taking place elsewhere in the city—investment firms purchase land, then it sits vacant for months or years while they await funding and approval from the city to begin constructing new housing. 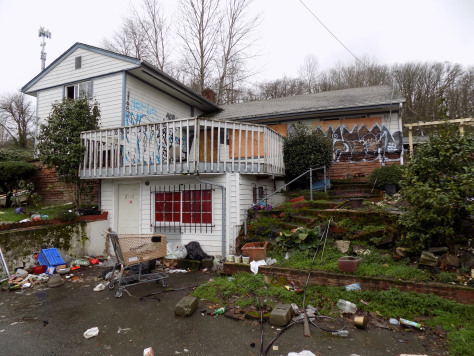 In the interim, squatters make use of the properties as a place to stay. Mount Baker Associates LLC started buying land on the acre and a half site in 2008, paying millions for property a short distance from the Mt. Baker light rail station. A contract rezone dispensed by the city allowed the two new buildings to stand seven and eight stories tall. “The City of Seattle has been really supportive of our project, a little slow in the permitting process. They’re a little behind the eight-ball now, but in terms of their support for our project we were very pleased,” said Michael Ross, the Principal of Reve Development and joint owner of the site. The new complex will use the city’s Multifamily Tax Exemption Program, giving the owners a tax discount if they guarantee 20 percent of the new units will be deemed “affordable” by attaching their rental price to percentages of the area median income. The building will offer studio, one and two bedroom units with prices starting at $1,450 a month for studios. The 20 percent units will begin renting at $1,028 for studios, $1,344 for one bedroom units and $1,836 for apartments with two bedrooms—prices still out of the reach for many residents in the community. The project will also take advantage of the government’s EB-5 Immigrant Investor Program which grants foreign investors lawful permanent residence visas for investing in businesses projected to create employment in rural areas or places with high unemployment. President Donald Trump renewed the almost three decade old EB-5 program as one of his first acts in office, and according to the Congressional Research Service, 84 percent of visas the program granted went to Chinese investors in 2015. Members of the investment group take turns demolishing a fence on the property in front of news crews. [Photo: Will Sweger] Christopher Chen procured $500,000 mostly from Chinese investors for the new development. As his family looked on, he took turns with co-owners Ross and Spitzer piloting a small excavator to tear down the dilapidated fence on the property.